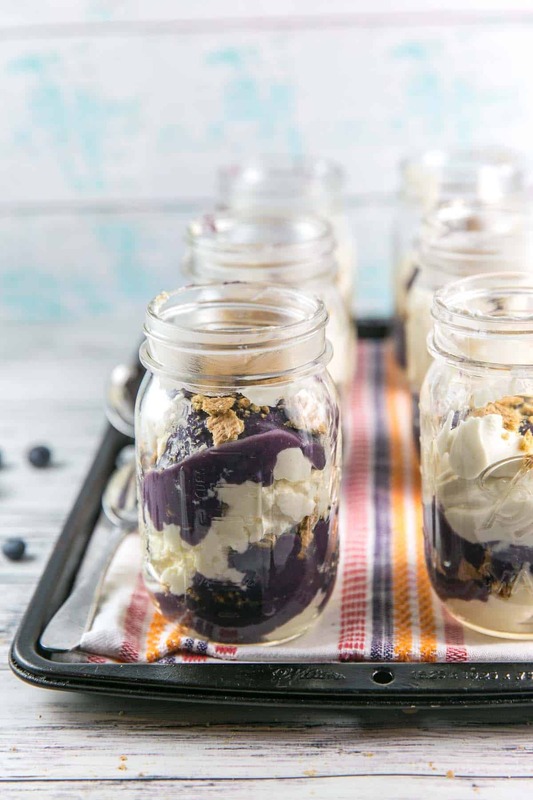 Creamy, rich, and smooth no bake cheesecake with layers of blueberry cardamom curd and graham crackers, served in individual jars. 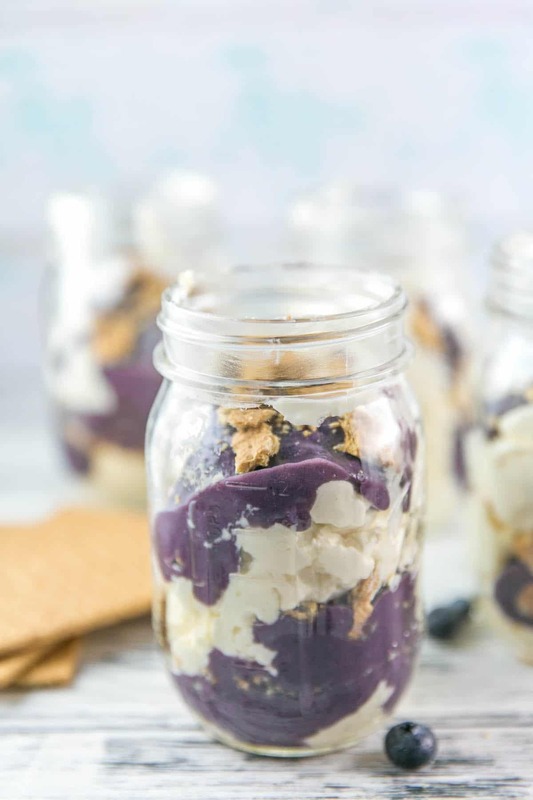 These no bake cheesecake parfaits are an easy make ahead treat perfect for your next dinner party! People often ask where I get the inspiration for many of my original recipes. Most commonly, we ate dinner somewhere or spotted something while traveling that looked delicious, and I decided to try to create my own version. Sometimes, someone else quite literally tells me what to make. 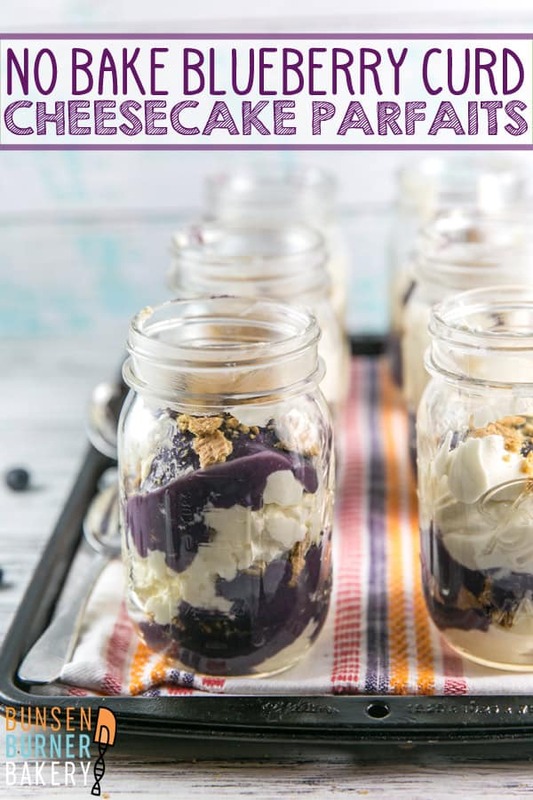 Which was exactly the case with these no bake cheesecake parfaits with blueberry curd. Our friend, Erica, is a personal chef (if anyone in Bucks County, PA needs a personal chef service, I fully endorse her amazing cooking!). At a recent dinner at her house, she served Ottolenghi’s Set Cheesecake with Plum Compote for dessert. Halfway through dessert, she mentioned how well the cheesecake would pair with my blueberry cardamom curd. And thus, here we have: no bake cheesecake parfaits (adapted from Ottolenghi’s set cheesecake recipe) with blueberry cardamom curd. Erica was right: they do indeed pair together beautifully. 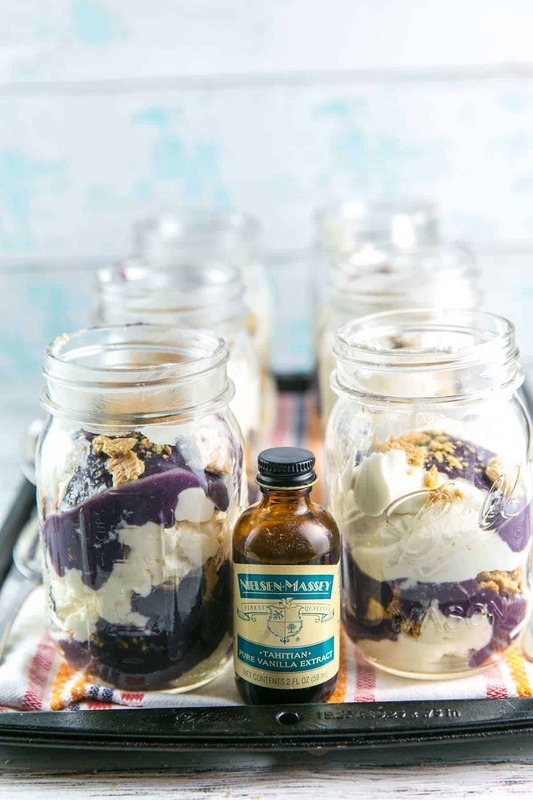 The no bake cheesecake made the perfect backdrop to try out some new Tahitian Vanilla I received from Nielsen Massey. Because Tahitian vanilla is extremely susceptible to heat, it’s perfect for cold and no-bake desserts, like this cheesecake. 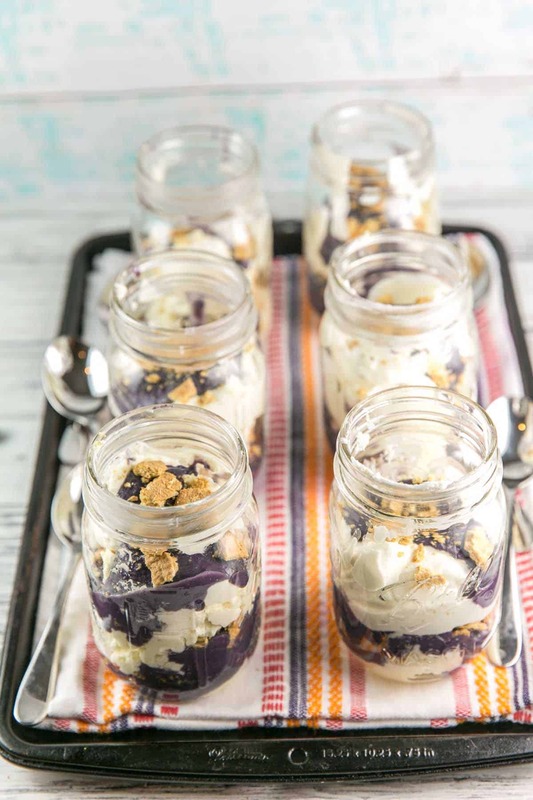 Since vanilla plays such an important role in baking, let’s talk a little about vanilla before we dive further into these no bake cheesecake parfaits. There are three major types of vanilla: Madagascar bourbon vanilla, Mexican vanilla, and Tahitian vanilla. All three contain vanillin as the primary flavor compound, but pure vanilla contains several hundred other compounds which distinguish the types from each other. Madagascar vanilla is the most common — what is generally used when we think of vanilla extract. When you try to imagine what vanilla tastes like, you probably think of Madagascar vanilla. It has slight floral overtones and a pure vanilla flavor. Madagascar vanilla is best in baked goods for a subtle vanilla flavor. Mexico is the originator of all forms of vanilla. All vanilla used to come from Mexico, until people figured out how to pollinate vanilla without a specific species of Mexican bees. Mexican vanilla is darker and richer than Madagascar vanilla with a woody and almost spicy flavor — almost like licorice. 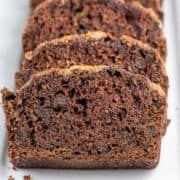 Madagascar and Mexican vanilla originate from the same species of vanilla (planifolia vanilla), and thus are pretty similar: in baked goods, it’s hard to distinguish between the two, although Mexican vanilla can taste a little spicier and pairs well with chocolate and citrus. Finally, Tahitian vanilla is much fruitier than other vanillas and contains less vanillin. The end result is a more floral, almost cherry-like flavor. Because there is less vanillin, the flavor can easily be overpowered, and it is best uses in applications where vanilla is the main flavor profile. It’s also very susceptible to heat, and thus shines best in no-bake cooking and desserts. 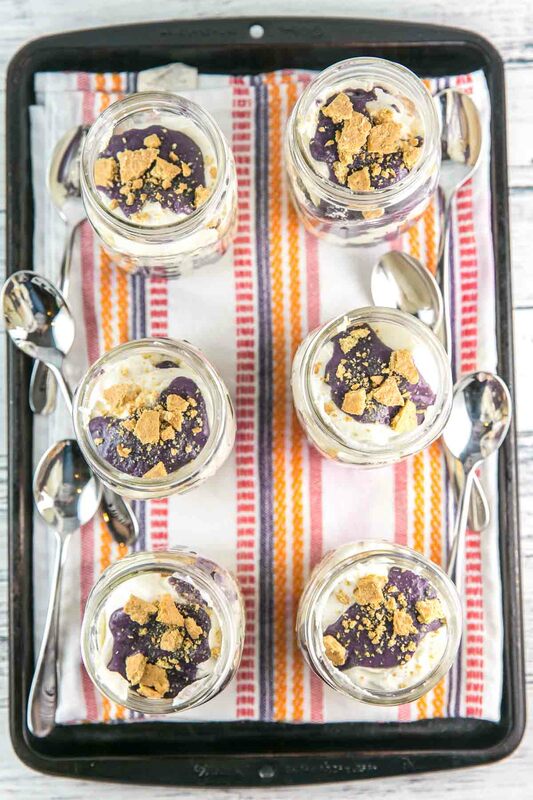 Now that we’ve talked about the types of vanilla, let’s talk about these cheesecake parfaits. There are only 5 simple ingredients in the cheesecake: cream cheese, mascarpone, sugar, vanilla extract, and heavy cream. Because of the relatively neutral flavor palate, the Tahitian vanilla really has a chance to shine. I wasn’t sure how much of a flavor difference would come through, but these cheesecake definitely tasted (and especially smelled!) more floral than with a non-Tahitian vanilla. The cheesecake component of these no bake cheesecake parfaits is the easiest. This is my favorite kind of dessert: minimal effort, but still fancy enough for entertaining. Are you ready for how hard this is? Beat together the cream cheese, mascarpone, sugar, and vanilla extract until well combined. Then whip the heavy cream until soft peaks form. Fold the whipped cream into the cream cheese mixture. Done. Whew – that was hard… can you handle it?! The best part is you’ll want to do this the day before. The cheesecake sets up to a nice firm texture after overnight refrigeration. 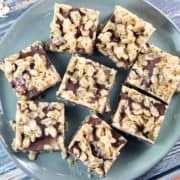 Make ahead party desserts: my favorite! Another easy-peasy, make ahead component! All the info you need is on my blueberry cardamom curd recipe. This is also a simple 5 ingredient recipes: blueberries, sugar, cardamom, eggs, and butter. The blueberry curd takes a little longer to make than the cheesecake, just because you do have to bring the mixture to a boil, but it’s still an under 30 minute project. You’ll also want to make this ahead of time too, so it has time to chill. If you want to leave it more customizable, divide up the cheesecake among 6 bowls and allow individuals to scoop their own toppings. You could even do this as a dessert for a large party with many toppings — make a triple or quadruple batch of the cheesecake and serve with different flavors of curd or jam and different crumbles. Cookies, pretzels, graham crackers, chocolate chips — all would be delicious! 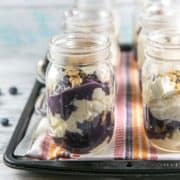 In summary, these no-bake cheesecake parfaits with blueberry curd are: easy, fancy, delicious, customizable, and can be made ahead of time. In other words, the perfect entertaining dessert. 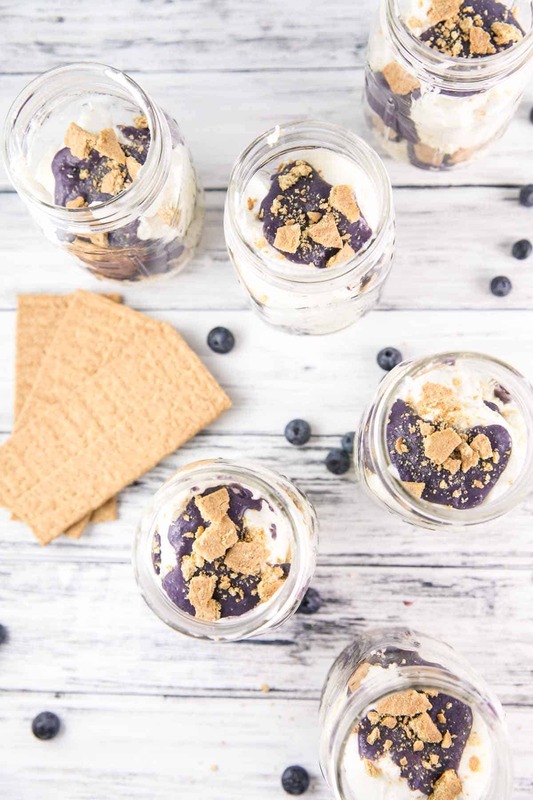 Creamy, rich, and smooth no bake cheesecake with layers of blueberry cardamom curd and graham crackers, served in individual jars. To make the cheesecake, combine the cream cheese, mascarpone, and sugar in a large bowl. Using an electric mixer, preferably with a paddle attachment, beat on medium speed until the mixture is soft and well combined. In a separate bowl, whip the cream and vanilla extract until soft peaks form. Using a spatula, fold the whipped cream into the cream cheese mixture by hand. Cover the bowl with plastic wrap and refrigerate for 24 hours, up to 3 days. 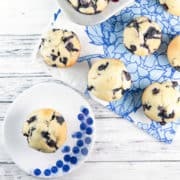 To make the blueberry curd, follow the directions for the blueberry cardmom curd recipe. Refrigerate for 4 hours, up to 2 weeks. 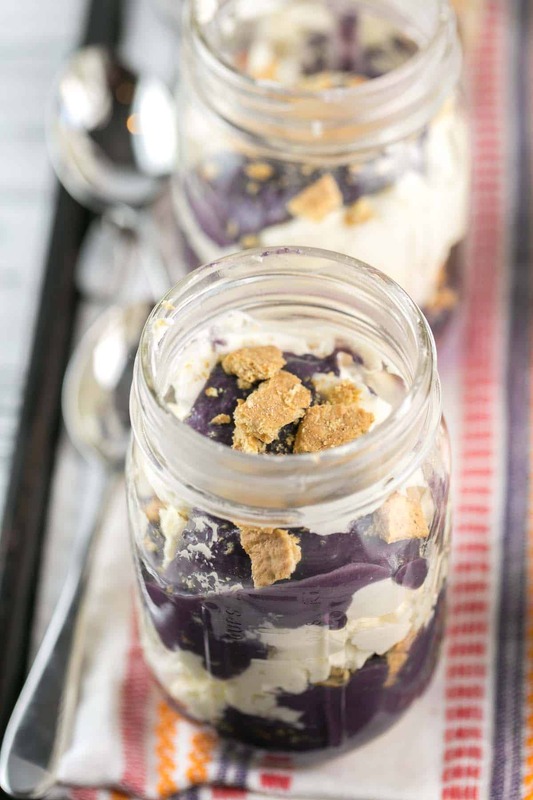 Immediately before serving, layer cheesecake, blueberry curd, and graham cracker crumbles in 10 ounce glass jars. Alternatively, serve bowls of cheesecake, curd, and graham crackers and allow guests to serve themselves. Cheesecake recipe adapted from Ottolenghi’s Plenty More cookbook. I agree with you, easy yet elegant deserts are perfect for entertaining. Love that your no bake cheesecake is best prepared the day before even – I love make ahead recipes. Sounds delicious! these look amazing Julie!!! I love cheesecake but mini cheesecakes are even better! Especially with blueberry curd!